This is an abstract base class for any elements of a drag and drop form. This can either be a container which will be represented on the screen as a tab widget or ca collapsible group box. Or it can be a field which will then be represented based on the QgsEditorWidget type and configuration. Or it can be a relation and embed the form of several children of another layer. Definition at line 37 of file qgsattributeeditorelement.h. Definition at line 60 of file qgsattributeeditorelement.h. Definition at line 77 of file qgsattributeeditorelement.h. 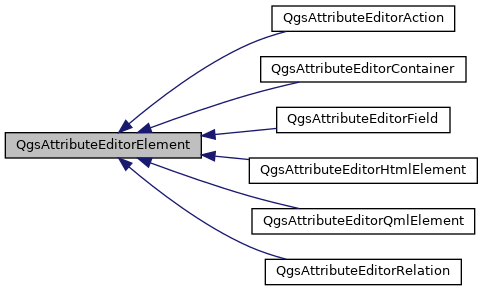 Implemented in QgsAttributeEditorHtmlElement, QgsAttributeEditorQmlElement, QgsAttributeEditorRelation, QgsAttributeEditorField, and QgsAttributeEditorContainer. Definition at line 91 of file qgsattributeeditorelement.h. Definition at line 105 of file qgsattributeeditorelement.h. Controls if this element should be labeled with a title (field, relation or groupname). Definition at line 128 of file qgsattributeeditorelement.cpp. Definition at line 123 of file qgsattributeeditorelement.cpp. Gets the XML Dom element to save this element. Definition at line 113 of file qgsattributeeditorelement.cpp. The type of this element. Definition at line 98 of file qgsattributeeditorelement.h. Definition at line 140 of file qgsattributeeditorelement.h. Definition at line 141 of file qgsattributeeditorelement.h. Definition at line 142 of file qgsattributeeditorelement.h. Definition at line 139 of file qgsattributeeditorelement.h.